A dehiscent dry fruit generated from a monocarpellary, superior ovary that dehisces from both the sutures into two valves. Example: Pea. A dehiscent dry fruit generated from a monocarpellary, superior ovary that dehisces from just one suture. Example: Calotropis. A dehiscent dry fruit generated from a bicarpellary, superior, syncarpous, ovary, that is unilocular however seems bilocular due to the false septum. Fruits dehisce all along both the sutures from base to apex and large number of seeds stay joined to the false septum termed as replum. Example: Brassica. 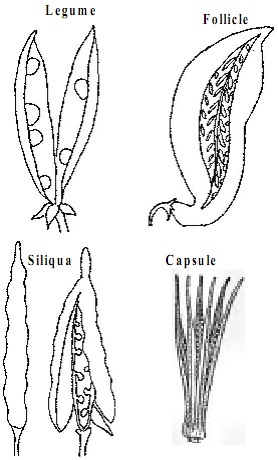 A dehiscent dry fruit generated from superior, syncarpous, or inferior ovary that dehisces all along two or more lines of suture in different ways. Tutors, at the www.tutorsglobe.com, take pledge to provide full satisfaction and assurance in Flowers, Fruits and Seeds homework help via online tutoring. Students are getting 100% satisfaction by online tutors across the globe. Here you can get homework help for Flowers, Fruits and Seeds, project ideas and tutorials. We provide email based Flowers, Fruits and Seeds homework help. You can join us to ask queries 24x7 with live, experienced and qualified online tutors specialized in Flowers, Fruits and Seeds. Through Online Tutoring, you would be able to complete your homework or assignments at your home. Tutors at the TutorsGlobe are committed to provide the best quality online tutoring assistance for Biology homework help and assignment help services. They use their experience, as they have solved thousands of the Biology assignments, which may help you to solve your complex issues of Flowers, Fruits and Seeds. TutorsGlobe assure for the best quality compliance to your homework. Compromise with quality is not in our dictionary. If we feel that we are not able to provide the homework help as per the deadline or given instruction by the student, we refund the money of the student without any delay.